MetalRockNews: Mastodon's Brann Dailor: "We have a whole new crop of songs"
Mastodon's Brann Dailor: "We have a whole new crop of songs"
Mastodon drummer Brann Dailor was recently interviewed by 93.3 WMMR radio, you can read some excerpts below. About the progress of the songwriting sessions for Mastodon's 2014 album "Once More 'Round The Sun", Brann said: "At the moment, it's just a ton of riffs, and they're kind of starting to form songs now, so we kind of have a… And we have some stuff that didn't make the last record, and not because it wasn't awesome, but it just didn't fit the vibe of the stuff we had more of. And we were gonna do this winter EP thing, but that material's kind of morphed into more than just that, so I think it'll warrant a full album release. So we have that stuff, and then we have a whole new crop of songs. We have a lot of material, so we have to whittle it down at the moment. And we're still just kind of experimenting. We go over to Bill's basement and sit down there and riff out, and throw everything up against the wall and see what sticks." He added that it's highly unlikely any of the new Mastodon material will be ready to be performed in time for the band's May 5 concert in Philadelphia, he said: "They're songs and they're riffs that belong together. But we write the music first, and then we kind of come in afterwards and figure out where we can shoehorn vocals." 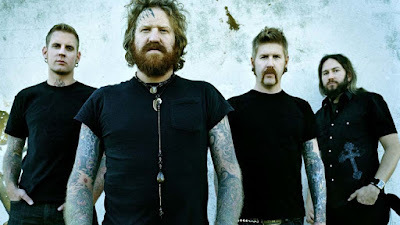 About the possibility of Mastodon's next album featuring special guests, he said: "I don't know. It just all has to be sort of an organic thing; it has to come up naturally. You write a part and you kind of feel like, 'Maybe so-and-so's voice would be suited to maybe sing that part.' But we always like doing that, and it's always usually surprise when we do it, except for Scott Kelly. You know, we don't put any pressure on him to be on the album. If he's feeling it, you know what I mean? But I always preface it with, 'No pressure, Scott.'"